This style is probably my go-to-never-fail outfit of choice for daywear. Blue jeans, white t-shirt, neutral accessories; how can you go wrong? I'm so in love with these jeans; the washed blue is such a great colour and I love the distressed details, not to mention their perfect fit - not too loose and not too tight, and they don't warp out of shape. Best pair I've bought in a while and they're from Billabong would you believe, better get in quick before they disappear. I've teamed them with my trusty basic tee from Witchery and my Tony Bianco sandals. All eyes on my new bag! Don't you just love it. I bought it over the weekend for bargain price of $49.99; very fair I thought from Forever New. It was just what I was looking for - a neutral tan tote for everyday use with some flashy details i.e., the gold features. Totally in love with it. What's your go-to outfit for daytime? I have a real weakness for shoes, there's just something about them. I love their design, shape, colours, what style they represent and that feeling of delight when you put them on and they look fantastic. Shoe shopping just makes me happy. In my future home I'm going to need a wardrobe a la Carrie Bradshaw; complete with feature shoe racks. To indulge your shoe-delight, I thought I'd compile together my tops picks for this season (at reasonable price points so they are actually achievable); here are the shoes that give me the warm and fuzzies. We all know I love my monochrome colours; here I am in my second favourite - white. Mix this shade back with some metallic accessories and I think you've got the perfect colour combo, not to mention it's sure to enhance your tan! I opted for a longer fine necklace to draw the eye down and these flat gold sandals. 7am - time to wake up, I usually check my emails and social media and attend to any blog comments from overnight before rolling out of bed. I have about an hour to get ready each morning [I usually spend a good 10 minutes of that time staring mindlessly into my wardrobe trying to decide what to wear] before it's time to head off to work. 8.30am - I'm at my desk checking emails and planning the day ahead. I do a range of things in my position; on any given day I can be coordinating photoshoots, organising talent (models, makeup, photography), preparing reports, writing web content and brainstorming PR strategies. 1pm - time to grab lunch, if I'm lucky I'll take an hour and whip down to Burleigh Hill where I can enjoy my sandwich while basking in the sun and watching the surfers cruise by. 5pm - I'm finishing up at work for the day. I try to get out and exercise at least 3 evenings a week, whether it's going for a run, a swim, a game of tennis, yoga or pilates. 8pm - if I don't have an event on or a catch-up with friends, you'll find me in the kitchen whipping up dinner, I love trying new recipes and sharing them with you [weekend baking is my guilty pleasure]. 9pm - I'm on my computer writing blog posts, researching or online shopping, after all I am a fashion marketer by day, blogger by night; there's no rest for the wicked. 11pm - if I'm not too tired I love to squeeze in an episode of my favourite show before bed (at the moment I'm watching revenge, made in chelsea and the carrie diaries) then I'll read for a while before it's time to get my beauty sleep. 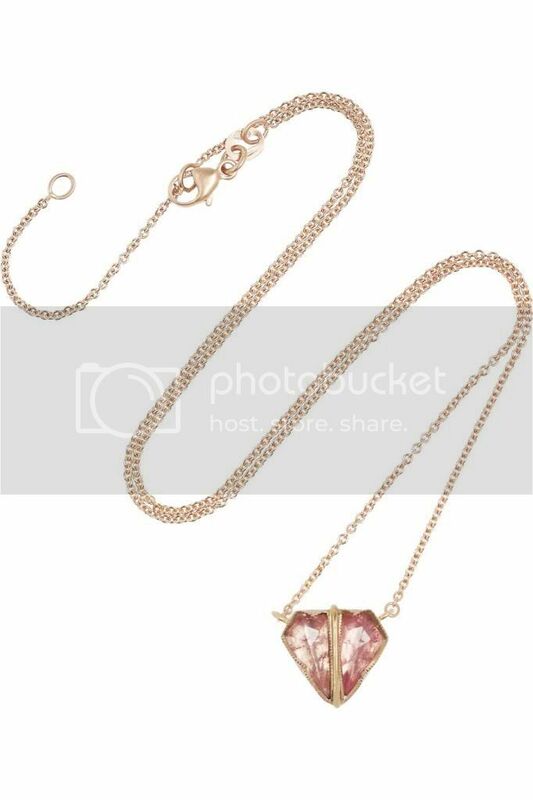 A quick scroll through Net-A-Porter's new arrivals provides me with my latest must have desire; this dainty-yet-antique-yet-edgy rose gold necklace by Brooke Gregson. 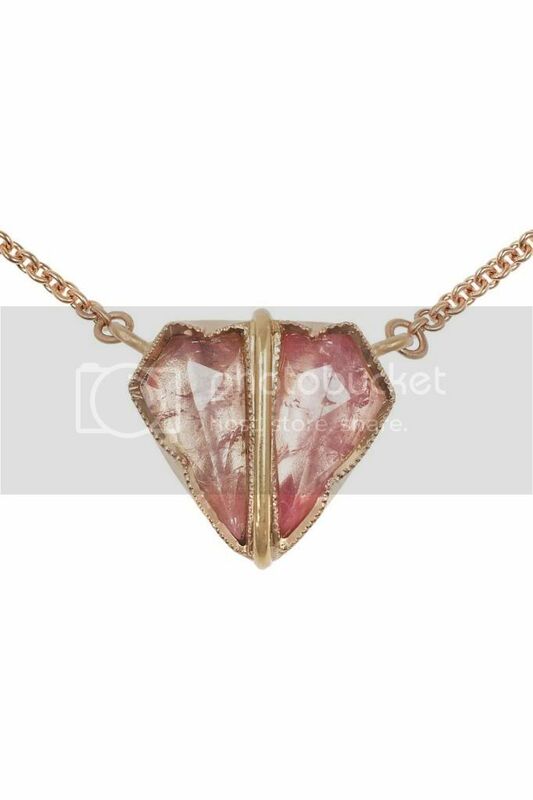 Its stunning pink hue stone has a feature cut with raw edges creating the perfectly accidental yet intentional heart shape. Perfectly offset by the rose gold, this stone has a beautiful pink/peach tone that would look so good against the skin. I think its best feature is its truly hand crafted look. Gushing much? You can tell I love it. For those of you who haven't visited the Mornington Peninsular along Melbourne's south east coast, it is a beautiful part of the world. I've been lucky enough to travel down this way a few times over the years and explore the many different things this region has to offer. It truly is a place you can enjoy all year round; obviously it's great to visit in summer to soak up the sunshine and have a dip in the calm bay waters, but even in winter the region has plenty on offer and the cold (often angry) ocean is a pretty spectacular site, plus there's plenty of vineyards around to help you warm your soul with a glass or two of wine. If you get the chance to visit, here are a few of the things I'd check out. Make sure you take a drive around this area. The houses on the hilltop are lovely and have spectacular views, and this little beach area is really quaint. You can also find some hidden paths leading down from the top of the Esplande to some pebble beaches that few people know about. I've been fascinated with hedge mazes since I was a little girl after hearing my English grandma speak about them. I finally made it to this one on my last trip down and it's really great. The maze is pretty big and surprisingly you will find you actually do get lost. But don't worry you'll always eventually find your way out. As well as the maze, Ashcombe has lavender gardens, a private lake, fountains and various horticultural delights. On the south east side of the district looking out towards Philip Island you'll find Flinders. It's a quiet little spot with pretty views and lovely beaches. There are some great cafes in town too so I'd recommend making this your lunch stop. Probably the two most iconic locations on the Mornington Peninsula, Sorrento and Portsea are like the Hamptons of Melbourne. 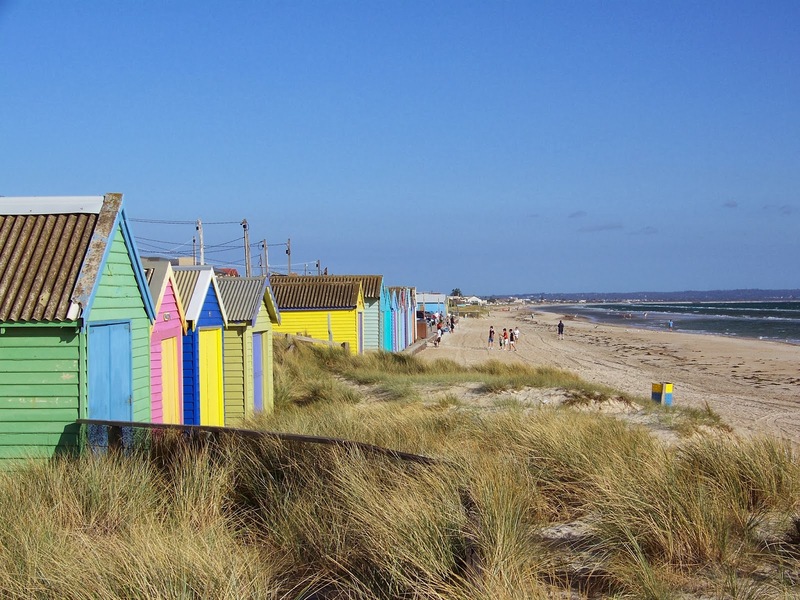 There are plenty of beach side mansions, kitchy homewares stores, those iconic coloured beach sheds and lovely places to dine. This is the perfect stop if you want the opportunity to live like the Victorian elite for the day. Let's not forget a very important component of this Victorian district; the vineyards! The area is abundant with local wine growers and producers, I guess you could say it's like the Yarra Valley's little sister. Make sure you do some exploring in the countryside and check out the varieties available. Arthurs Seat provides the highest look-out point in the area, resulting in some breathtaking views in all directions. It's great to venture up here to get some perspective and look out toward the endless ocean. You'll be able to see the entire coastline from up here, the outline of the city's high rises and the many ships on their way to port in Melbourne. I had to include this sunset picture I took, I think it's pretty spectacular. Ahh my favourite colour palette; black and white. How can you go wrong? Super chic and sleek and slimming to boot! Whilst I do occasionally love to dress with a pop of colour, you will most often find me in the basic shades; they suit everyone, you're guaranteed to look stylish and it's less likely that people will remember exactly what you wore (so you can avoid those "oh you wore that to Sarah's birthday" moments). I'm so in love with this jacket, it's one of my favourite pieces in my wardrobe. It's got a slightly longer length which is great for creating a longer, slimmer silhouette. I can wear it with cuffed sleeves and open or with straight arms and done up for a more corporate look. What are your favourite styles and colours to wear? I've never been that huge of a sandwich fan, which is why I love meals that I can cook for dinners and then take to work for lunch the next day. My lovely friend Cayleh sat down the other day with these gorgeous looking fritters and I asked her for the recipe. So glad I did because they are definitely a winner; super simple, full of flavour and they freeze and reheat really well. These little guys have your dinner and lunches sorted... hell, they'd even be good for breakfast! Cook your peas in the microwave until tender; approx. 3-4 minutes then add them to a large bowl and mash them well. Add the spring onion, chilli, paprika, dill, fetta, eggs and milk. Mix well. Add the flour in a little at a time until you reach a pancake-like consistency. You may need a little more or less. Oil a large fry pan and, on medium heat, spoon tablespoon-dollops in to cook. They will shape themselves, I can fit about 4 in my pan. Cook for a few minutes either side. I don't know about you, but Henri Bendel is my absolutely favourite department store in New York... make that the world in fact. If you haven't had the chance to visit, HB is an upscale women's department store specialising in accessories and virtually everything they stock is their own brand, making everything super chic, recognisable and, more importantly, exclusive. Every year I fall in love with their stationary, jewels and little knick knacks. This candle is another thing to add to my wish list. Perfectly packaged and sweetly scented it makes a great gift. What a little gem this place is... I'm so glad I stumbled upon it! In the backyard of a 60's style apartment building on the Gold Coast Highway is Alfred's Diner; you'll feel like you've just arrived at one of Melbourne's latest hotspot as it's boasting plenty of cool vibes and is definitely not the usual for the GC. Essentially it really is like someone's backyard with assorted bench chairs, umbrella's, rugs and cushions strew about the place. Just don't make the mistake I did where you accidentally wander into the neighbour's backyard in your quest for lunch; if a brunette in her thirties gives you a strange look, you're in the wrong place... it's the next door down! I've never really been a fan of camping, in fact, in my 23 years on this earth I have managed to avoid it altogether. The idea of wrestling with tent poles, virtually sleeping on the ground and having an open door policy for all manner of bugs and creepy crawlies really turns me off. But... I think I might have found a way for me to enjoy this so-called 'necessary past-time' [with a little bit of adjustment]... Allow me to introduce you to glamping! 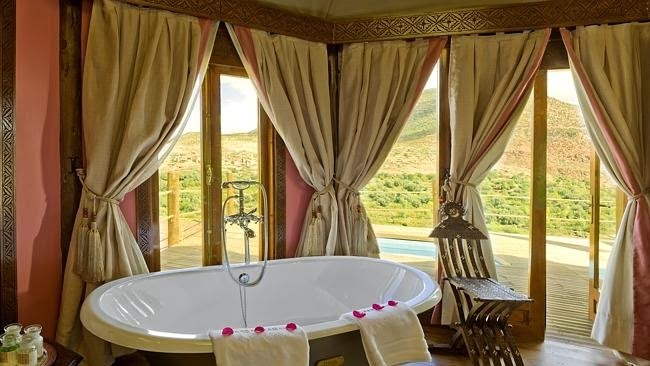 Let's be honest, it really isn't anything like camping; these luxurious sites are in a whole different league... I love it! Here are my top four picks for being 'at one with nature' without the discomfort. I bet when you think glamping/camping, England doesn't immediately come to mind, but I must say this is one of my favourites! Sure you can't lie around and sunbake in the chilly weather but it's a good opportunity for some forest adventure-ing and perhaps a spot of fishing. Plus with interiors like these who could complain? From $340/night. 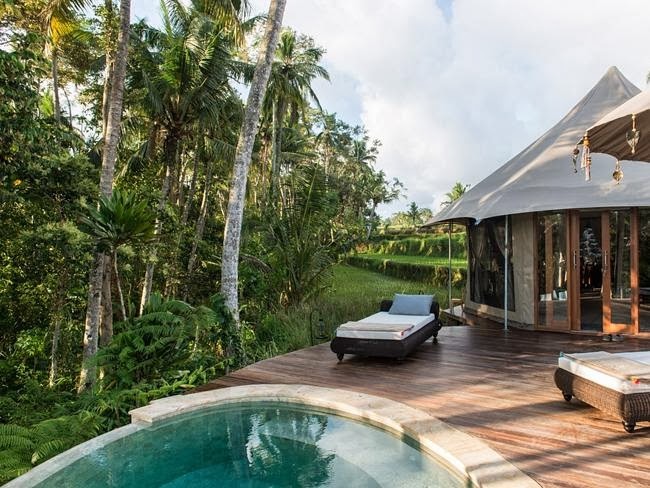 This is Bali's first glamping resort, situated just outside Ubud. 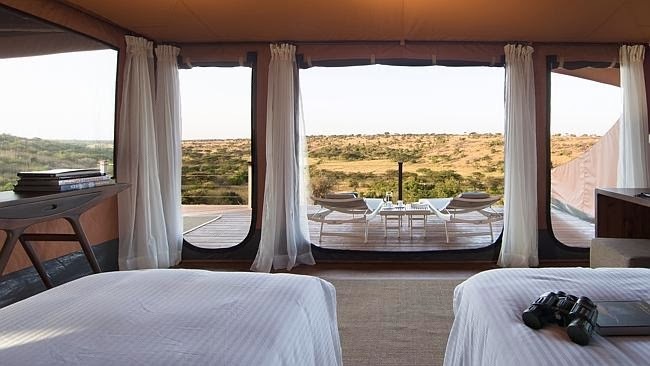 There are five luxury tents which each have an infinity pool [bonus!]. The interior is decorated with an elegantly styled beach-chic feel making it a great alternative to your regular beach getaway. From $220/night. This campsite belongs to Sir Richard Branson so it's got to be good! Just looking at the images makes me want to jump on a plane. 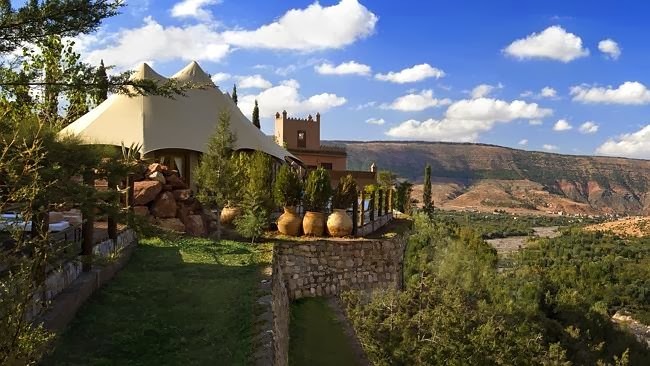 These tents feature king-size beds, private jacuzzi's and stunning views of the Atlas mountains. From $1,000/night. 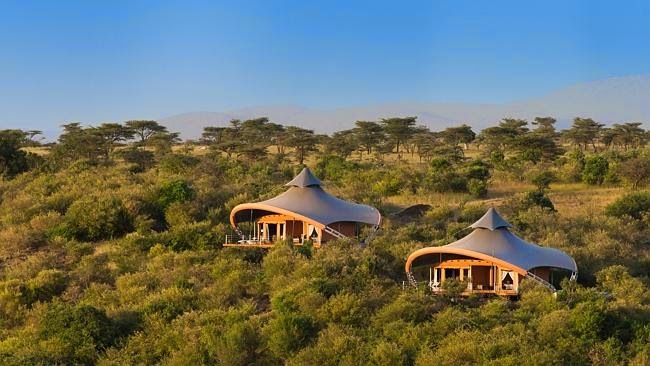 Another one of Sir Richard's sites, here, there are 12 safari tents on the Motorogi Conservancy where elephants, lions and giraffe roam; perhaps they might like to join you for breakfast on your private balcony. From $1,200/night. 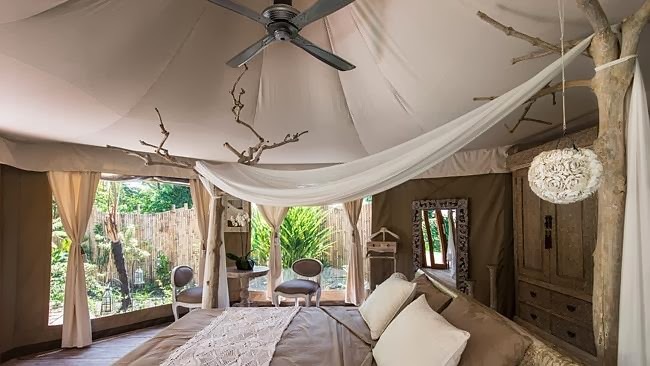 Photos courtesy of the glamping resorts.